A Member of the European Parliament (MEP) is a person who has been elected to serve as a popular representative in the European Parliament. When the European Parliament was first established, MEPs were directly appointed by the governments of member states from among those already sitting in their own national parliaments. Since 1979, however, MEPs have been elected by direct universal suffrage. Each member state establishes its own method for electing MEPs – and in some states this has changed over time – but the system chosen must be a form of proportional representation. 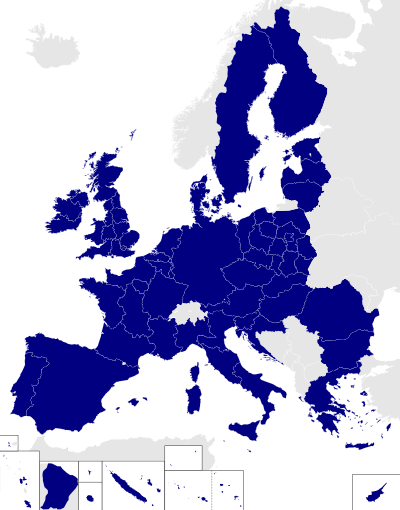 In some member states the MEPs are elected to represent a single national constituency; in others they are elected from sub-national regions. For a list of current MEPs, see Members of the European Parliament 2014–2019. The European Parliament has a high turnover of members compared to some national parliaments. For instance, after the 2004 elections, the majority of elected members had not been members in the prior parliamentary session, though that could largely be put down to the recent enlargement. Only one (Hans-Gert Pöttering) has served continuously since the first elections in 1979. MEPs are organised into seven different cross-nationality political groups, except the 15 non-attached members known as non-inscrits. The two largest groups are the European People's Party (EPP) and the Socialists & Democrats (S&D). These two groups have dominated the Parliament for much of its life, continuously holding between 50 and 70 percent of the seats together. No single group has ever held a majority in Parliament. As a result of being broad alliances of national parties, European groups parties are very decentralised and hence have more in common with parties in federal states like Germany or the United States than unitary states like the majority of the EU states. Although, the European groups, between 2004 and 2009, were actually more cohesive than their US counterparts. Since the ratification and entry into force of the Treaty of Lisbon the adoption of nearly all European Union laws requires the approval of both the European Parliament and the Council of the European Union. Under the co-decision procedure, they each have up to three readings of legislative proposals put forward by the European Commission in which they can each amend the proposal, but must ultimately approve a text in identical terms for it to be passed. This amounts to bicameralism. International agreements entered into by the European Union (e.g. WTO, trade agreements, etc.) must be approved by the European Parliament, as must the accession of new Member State to the Union. The total cost of the European Parliament is approximately €1.756 billion euros per year according to its 2014 budget, about €2.3 million per member of parliament. As this cost is shared by over 500 million citizens of 28 countries, the cost per taxpayer is considerably smaller than that of national parliaments. However it is sometimes characterized as expensive, because for example of the costs of translating all documents and interpreting debates in 24 languages. Members declare their financial interests, which are published annually in a register and are available on the Internet. Many outgoing MEPs move into other political office. Several presidents, prime ministers or deputy prime ministers of member states are former MEPs, including former President of France Nicolas Sarkozy, former Deputy PM of the United Kingdom Nick Clegg, former Prime Minister of Italy Silvio Berlusconi, Danish Prime Minister Helle Thorning-Schmidt, Belgian PM Elio Di Rupo. The oldest member is Jean-Marie Le Pen, aged 88, born in 1928, the founder and former member of the National Front. The youngest is Anders Primdahl Vistisen of ECR, aged 29, born in 1987, who joined the parliament in 2014. An unofficial list of MEPs Twitter accounts can be found here. ↑ Kreppel, Amie (2002). "The European Parliament and Supranational Party System" (PDF). Cambridge University Press. Retrieved 12 June 2007. ↑ Kreppel, Amie (2006). "Understanding the European Parliament from a Federalist Perspective: The Legislatures of the USA and EU Compared" (PDF). Center for European Studies, University of Florida. Retrieved 26 September 2008. ↑ ""What to expect in the 2009–14 European Parliament": Analysis from a leading EU expert". European Parliament website. 2009. Retrieved 17 February 2010. ↑ Fresh start with new Members' Statute: The salary – a judgmental question. European Parliament Press Release. 7 January 2009. ↑ "EP adopts a single statute for MEPs. ".